Advantages: Unit operational use, pictures from the original manuals and profiles of 22 aircraft. This is the first in Mushroom Model Magazine’s Orange series. According to MMM, the Orange series combines the Yellow Series’ focus on aircraft with the Red Series’ focus on history; hence Orange. But, with MMM’s Blue, Yellow, Orange and Red Series, their catalog is beginning to remind me of the U.S Department of Homeland Security’s threat alert color chart. All that is needed would be a Green Series to complete the picture. What I find unusually fascinating is that the cost of the aircraft is set out: Total cost 230,000 zloty each, with the three machine guns alone costing 15,000 zloty. If only we knew what the zloty was worth in U.S Dollars or Pounds Sterling back in 1935. But for all that money (it was a lot, I presume), the first version of the Karas was a dismal failure and was deemed effectively useless as a combat aircraft. It then underwent a re-engineering which produced the final combat ready version, even if it did spray oil over the windshield. The book then goes on to describe the export variant, the PZL.43. It differed primarily in that it used a twin row radial engine which required that the cowl mounted machine guns had to be mounted on the outside in their own nacelles, rather than firing between the cylinders. By the outbreak of the war, Bulgaria was the only customer for this model. The Bulgarians called it “Chayka” or Seagull; a bit nicer sounding than Carp. By the way, the PZL.43 cost 236,000 zloty. The heart of this volume is the operational history. We get a brief overview of the pre-war use. Once again we are reminded that Poland was involved in territorial conflicts with Czechoslovakia and Lithuania. We also find that the Karas engaged in reconnaissance incursions over German territory. With the invasion of Poland, the monograph turns its focus to each bomber and reconnaissance unit that operated the Karas. The operational descriptions are quite straight forward, lacking drama. But, one can imagine the drama that occurred. At the conclusion of the operational use section, the book has a single page on the evaluation of the aircraft. 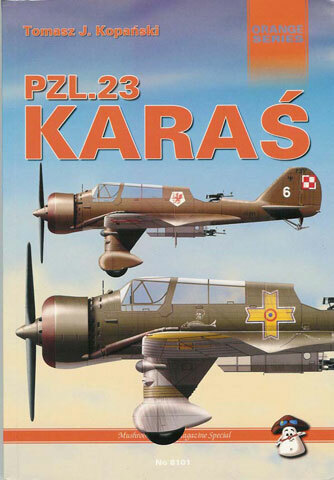 Basically, the Karas suffered an 86% loss rate, the highest of all Polish aircraft, and that without Polish air superiority, the Karas was virtually useless. Before going on to the technical sections, the monograph briefly covers the Karas in foreign service. Bulgaria used the PZL.43 export version, and Rumania used the PZL.23 which were “evacuated” to Rumania. It is not clear if this means Polish pilots fled to Rumania with their aircraft, or they were given to Rumania by the Germans. The technical section is small, but in my opinion, nicely done. There are numerous line drawings of the various models of the Karas. There are also numerous pictures from the original manuals for the aircraft and engines. All this will be quite useful for those wanting to build the expected 1/48 Karas kit. Finally, there are the profiles. Of course they focus primarily on the Polish Air Force aircraft, and, also of course, only one color is dominant – Khaki-Brown. Additionally there are profiles of the Rumanian PZL.23s and the more colorful Bulgarian PZL.43s. I don’t want to finish this review without remarking on the photographs that fill this volume. I am always surprised that so many pictures of reasonable quality survived. Of course many of them, regretfully, are of damaged and captured aircraft. As most now know, I have a particular fondness for the air forces other than those of the five major combatants (USA, UK, USSR, Germany and Japan) of the Second World war and for the less than glamorous aircraft that they often used. For those that share my interest, and even for those who do not, I recommend this volume. It is a very good introduction to the Karas and its operational history. North American distributors are Squadron/MMD, Australian distributors are Platypus Publications. In Europe, the books are available from any good bookshop (via our UK distributors, Orca). Contact MMP direct in case of difficulties.